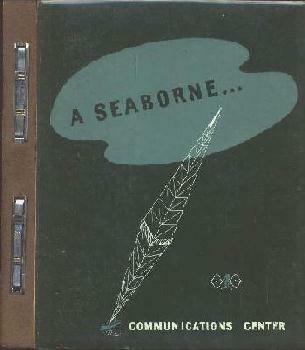 This is a brochure about the Army communicating at sea during World War II. After each new advance of our forces, headquarters elements move forward .... taking with them their specific communications requirements. In th past, each new base has required radio station construction. ... all requiring months to provide before the communication center can function. Circuits are required to forward and rear bases, to other theaters and to the United States. Necessitating numerous radio transmitters, receivers, and special equipment to be installed. Then, as the operations advance, the whole wary process must be repeated. Recovery of all plant in impossible. Disassembly, and shipment of delicate apparatus increases damage and loss. Could an entire self-contained communcation center be picked up bodily and moved? Watch! Into an island harbor steam tugs, towing five efficient looking ships. They are anchored -- three near the headquarters area, two more several miles away across the bay. Masts come erect, antenna wires in place. Powerful diesel generators are started. Trained men board the ships. 48 hours after the ships come to rest, messages flow smoothly and quickly to key points. Operators on Receiver Two pound out traffic, keying their transmitters through VHF links. Q section men on Receiver One feed teletype tape into transmitter-distributors, radio teletype transmitters on Transmitter One five miles away follow each teletype character. Typed tape appears at the other end 14,000 miles away. Through this seaborne center could pass one million code groups every day! Shifts change: supervisors, operators and attendents leave their compact, bright, well-ventilated positions, board the motor-tender, and are taken to the quarters ship. On board this spacious ship is every facility for quarters, mess, and administration. Comfortable men  efficient operation. General MacArthur's sea and air power ranges forward. Bases once of major importance are now too far to the rear. Behind us now lies a trail of not dollars, but material-man-hours, ship tons in irrecoverable installations. This time: While seaborne communication center No. 1 carries the ball at base "N", seaborne center No. 2 is already on its way to base "N + 1"!